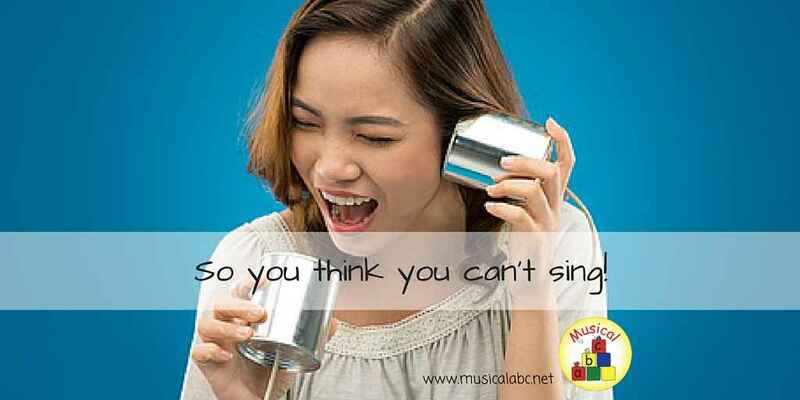 So you think you can't sing! I hear so many adults saying this to me. I would like you to ask yourself: why am I thinking this? Is it that you struggle to sing along to some songs on the radio, did someone make a comment in the past or maybe you just believe you can’t sing? The children in your setting want to sing and so they need you as their carer/teacher to teach them new songs and rhymes. So, whatever the reason you need to overcome that fear and start singing! Do you love singing along to the radio and sometimes think, ‘argh!! that’s too hard to sing’? I can honestly say that I struggle to sing along to some songs on the radio as they are out of my singing range. What do I mean by this? Well, they either go too high or low for my voice to comfortably sing. I love singing but I have only ever had a few singing lessons and these were on my musical composition course when I was 18 years old! Without giving my age away, that was a long time ago! So, I am not a trained singer but I can comfortably and confidently sing songs within my range. You can do the same! If someone made a comment about your singing voice in the past and this has left you scared to singing or even if, whatever reason, you believe you can’t sing, please don’t let that stop you singing! You might not believe this but singing is actually good for you!!! So what can you do? The vocal cords like any other muscle in your body need to be trained. Training takes time and patience; sing a little every day and you will see a difference. Your aim is to be able to sing with the children so please read on to find out what you need to do! What can you do to start singing with the children? So, how do you choose a song that is going to be comfortable for you to sing? As you are going to be working with young children you have a good starting point with your singing. Young children have a very small singing range so ideally you should mainly choose songs that have a small range; this will be good for them but will also help you develop your singing voice at the same time! If you have a favourite nursery rhyme that has a big range and jumps in pitch try saying it rather than singing it. For example: Humpty Dumpty and Hickory Dickory Dock are both tricky nursery rhymes to sing! Here are the words and the notation of the notes I am singing for those who are able to read music. This pitch is ideal for young children. If it is too high for you try starting a little lower. Teaching the song you have chosen! The only way to teach songs to children is to sing with them. First, you need to learn a song yourself before you try to teach it to the children. Also, don’t use a backing track when teaching a new song. The children need to hear the tune and words, not the jolly background music. Although you might like to record yourself singing the song so that the children can try singing along in the music area at other times. If you sing a little every day with the children you will see improvement in both the children's and your singing. Most of all singing should be fun, so just pick a song and go for it! The children are not going to judge you they just want to sing and have fun!